How was this possible? Jenny Craig? The 2018 Dodge Challenger SRT Demon is on its way and, not surprisingly, we’re anxious to learn as much as we can before its April 11th debut. Fortunately, Dodge has setup a website solely for the Challenger Demon, but Motor Trend and Autoblog have found out some very interesting weight loss details that clearly show Dodge’s commitment to making this car incredible. 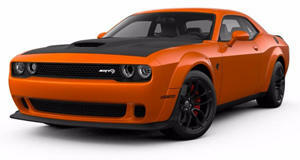 All told, the Challenger Demon will weigh 215 pounds less than the Challenger Hellcat. How this was made possible? By removing many things, including - wait for it - the front passenger seat. Yes. That 58-pound front passenger seat will be optional, along with the 55-pound rear seat. The seats alone account for a significant chunk of shaved fat, but what else has been removed? Examples include the 4-pound tilt and telescopic steering wheel, numerous NVH components worth 18 pounds, parking sensors (2 pounds), aluminum wheels with open lug nuts (16 pounds), all speakers, except for the front door units (24 pounds), and 20 pounds worth of trunk lining and the spare tire and wheel. Along with the removal of those things, Dodge did add some poundage, 17 to be precise, due to the wider fender flares that also increases vehicle width by 3.5 inches. We’ll hopefully learn more details before the big debut, but until then check out the latest Demon trailer, courtesy of Dodge.